Publishers leveraging Google AdSense ad units on their site have recently noticed a new Google penalty affecting their ad earnings. Both AdSense publishers and larger publishing groups that leverage Google AdX (and serving AdSense ad units) were caught off guard by this latest change. This penalty is often referred to as the “Two-Click” AdSense Penalty. Below, I’ll show you exactly what the penalty is, how to check if you’re being affected by it, and what to do in case you want to remove the AdSense penalty. What is the “Doubleclick” AdSense Penalty? You’re probably not sure what the “Two-Click” – or double click AdSense penalty is, but are likely reading this because you’re concerned it could be affecting you (or will affect you in the future). There isn’t a cut and dry answer that I can give you. I can only give you a Google answer. Below is Google’s response to our inquiry about a publisher affected by the penalty. There you have it. A very Google answer; yet it does provide us with enough insight to investigate and solve the problem. The number one warning sign of the penalty is decreased AdSense earnings from AdSense ad units. This is super easy to check in Ezoic. Check earnings/EPMV by a device for a sudden dip in mobile EPMV to see if you could be affected by this issue. The next step in diagnosing the issue is to see if you are being affected by the penalty. This will require you to install the Google Publisher Toolbar. The toolbar will allow you to see if there is an added click necessary for users once they click on an ad unit (this means users would have to actually click an ad twice for it to take them to the advertiser’s website). 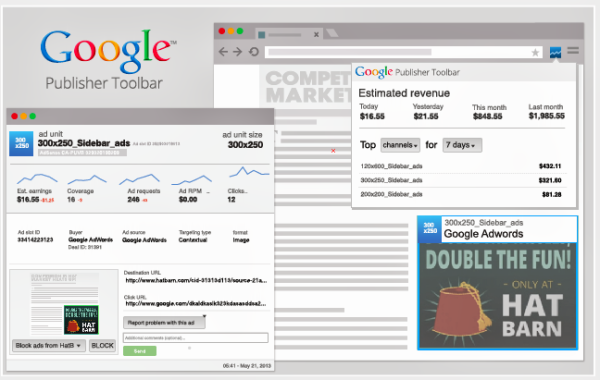 Sign-in to the toolbar and enable the overlay to begin viewing your pages with AdSense ad units. If you have an ad (or several) in locations where the CTR (click through rate) suddenly fell off a cliff (declined significantly) this is your smoking gun! The reason for this is that users now actually have to double-click AdSense ad units once the penalty is in affect. Keep in mind this only happens for Google ads. Other ad providers (e.g. Criteo) will not have the penalty present for their ads. A decline in overall EPMV and CTR on your current AdSense ad units are indicative qualities of this penalty taking place. Run a report in ADX to identify ad units with high CTR (if you’re an Ezoic customer, your account representative can help you with this if you’re not sure how to do it on your own). See all of the ones that have fallen off in the same manner recently (you can also just repeat the step from the last section and use the Google Publisher Toolbar to do this). 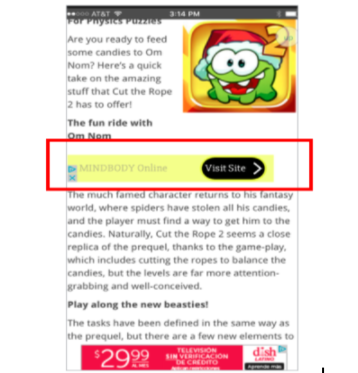 After the ad unit is identified, either delete it or reduce sizes to smaller sizes on mobile only – e.g. 320×100 (no boxes) and add extra padding, 30px top and bottom. This will likely fix the issue; although the results will not be instantaneous. This can be the frustrating part, but just remain diligent and ensure you’re monitoring the potential problem units and your EPMV. A two-click AdSense penalty does not receive a violation notice from Google; nor are there any notifications in the publisher’s account if they are being affected by this (from Ezoic or Google). The penalty is an automated change by Google based on sites getting a high percentage of accidental clicks. Penalties are temporary. Typically, they are lifted within 2-4 weeks (sometimes sooner) after Google does another round of automated site reviews. Be patient and your missing revenue will return to normal levels after the penalty is removed. Share your experiences with this penalty below. I’ll monitor the threads and contribute however I can to help. If you’re using the Ezoic platform, you can reach out to your account rep for assistance. 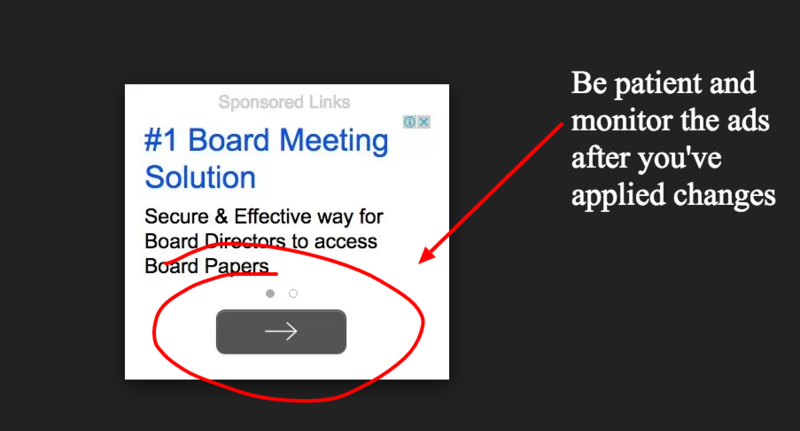 Is that you mean that if you reduce ads above-the-fold, the penalty doesn’t instantly disappear? Nice and helpful. This will help me to be more careful. Thanks. Hi! very helpfull!thank you..two questions..
1)Typically, they are lifted within 2-4 weeks (sometimes sooner) after Google does another round of automated site reviews. This means that it will be lifted anyhow? or after you make the changes? 2) the text ad in the photo:” monitor the ads after you ve applied changes”, the arrow button shows something? it changes form for some reason? 1.) If you’re being penalized for the double click violation, you will likely see it removed in 10-14 days after the correction, but this isn’t a hard and fast timeline. You need to make the correct changes and be patient. 2.) There is no change here in the way the ads appear on the surface. I am having this frustrating problem with one off my websites. The website is online for 6 years making 6 figures a year with 70% mobile traffic (past 3 years). Revenue dropped 93%! for mobile devices. and now they just dropped me without a warning what so ever. After adding extra padding and labels I contact Adsense support to check the status. Got a reply that it was good I made the change and now is policy complaint. It now is 46 days later and still no change in revenue. Does it take time to get back to normal, since the penalty is removed? Mobile Italian traffic only was hit – 0.19% ctr dropped to 0.01%…. I added ,,Advertisment” label, a 20px padding top/bottom, anything else that I might need to do to speed things up? Nothing you can do to speed up the process. If you work with Ezoic, contact your account rep. They can usually review and make sure everything is properly fixed and then work with Google to ensure things get coordinated quickly. Are you confident you have removed the issue? If so, it can often take a while for Google to remove the penalty. How long would you consider a while being? What type of data were you looking at that made you believe that they had actually removed the penalty? What have you done to ensure that this has been resolved? Also, have you been able to actually confirm that you have the two-click penalty? I added a label to the ad, increasing the distance to over 30px. I found out that my site has a large amount of traffic from Facebook bots (25% of ad impressions), could it be the reason for this penalty? This would not be the reason for a 2-click penalty. 2-click penalty, or “double click ” penalty, can be determined using this blog. Not something that has to be guessed. Great article, Tyler. I saw my CTR for an ancient and very consistent site go go over a cliff – from 1% to trending between .2 – .3%. Having read the article through 3x, I’m sure I’m being thick here, but precisely how do you confirm that you have a double-click penalty? I am noticing slightly lower CPC after recovering from the double click. Is this normal or could be due to seasonality? Thank you for letting me know about this article. I believe it is seasonality as well, but it’s never been this low before during July. If it is because of smart pricing, do you have an article on that or know how long it takes to recover from smart pricing after making the correct changes? Usually, the seasonal drop from July will last – at max – 4-6 weeks. Since we are in a record-breaking year, if it is seasonal you will see it rise back up in August. Pretty much every major site sees a drop to start in July. The reason I’m wondering is because the drop is 40% to 50% in CPC and I believe it started on July 1st but it is hard to tell because that is the same day that the double click penalty was lifted. My CPC right now is 2 or 3 cents average and it is freaking me out. What is your opinion? That it is in all likelihood seasonality. Ever since my site recovered from the double click penalty, I’ve been seeing a lot more rich media ads being served than usual. Is this normal? Is there anyway I can bring text ad ratio back up? Robert, there are a lot of other phenomena that could cause you to see different types of ads. Do you have any objective data showing that more rich ads are showing? What is the concern that you have with them? Just curious. Rich media is always bought on cpm, not cpc. This might mean that Google has seen that your eCPM is higher with more rich media ads. It may be optimized around this now. This might mean lower CPC and lower CTR, but better CPM rates. But CPMs and CPC are both terrible metrics for publishers to optimize around. Rev should always be optimized around ePMV. Thats what Ezoic does. Thank you for your article, very helpful for my optimization. Hi. I am seeing a new text ad style where instead of arrows it shows and open button on the as on almost every site. Have you seen this? First, I would like to thank about this article. It’s the only clear one that I’ve found on internet regarding double click penalty. As you may already guessed, I am also facing the DC Penalty from adsense. And this IS LASTING since nearly 1 month..
Now, I am using auto ads since 2 weeks, guessing that google will only place ads according to its own policy but … still have this penalty . -Does the recovery could happen if I continue to use Auto Ads ? -If I switch again with Ezoic, I will get some help from my Ezoic advisor and surely get rid of this penalty ? ( I know that the customer support is great around here ). 1.) Auto Ads will not fix this issue if it is truly DC penalty (it could be something else if you’re not 100% sure it is DC). Auto ads actually can often cause more issues. 2.) Ezoic team could help diagnose issue and ultimately prevent it. Can also help you understand if it is really DC or not. Hi. I recently received the double click penalty on mobile, but it doesn’t seem to be affecting every browser or if it does, some ads are still one clicks. Have you heard of this before? Please let me know. Typically this penalty affects all “nessie” ads. The ones that include text and an arrow click button. It is affecting all ads, but it is showing a blue button that says visit site when the ads are clicked, is this what you are talking about? Me in the past when I have brought this up. Have you heard of something like this? It has been happening since 2017. It is a common practice to see this. Okay, and does this also usually last 2 to 3 weeks from what you’ve seen? Great information. I think I’m lost on a step – I’ve installed the Publisher Toolbar and activated the overlays on my site. What exactly does one do from there to confirm the “visit site” popup? I’ve been back and forth with Google Adsense trying to figure out why i got the penalty. it was turned on and of various times since August 2018. This was only affecting the mobile version of some of my sites. What is crazy is that in January 2019, everything looked quite good and the penalty had been removed for some weeks after so changes I did. Then I removed all fixed ads and left only google auto ad on the two of my sites (mobile version). A couple of days later Google is adding the penalty again! Google is now running the show and can place the ad wherever they want. If it is placed too close to any button for accidental clicks or whatever, it is google auto ad causing it. This is really frustrating. I think my next step will be to turn of Google auto ads and see if things go back to normal because last fall has been really bumpy and a huge loss in revenue. Google don’t seem to bother much, just blaming that bot. They are very kind in writing on emails though. But doesn’t help me..
Jon, this does seem to be a big problem with Auto Ads. You may want to try Ezoic if you’re having issues with compliance. Ezoic can ensure you don’t violate policy automatically. I have been dealing with this double Click Penalty for around 22 days. Should I recover from it soon? I have removed ads and added advertisement tags to the ads that are still on my site? James, have you verified it as the two-click penalty? Advertisement tags probably won’t help solve this problem at all. The advice in the article is the best practice. If you work with a Google partner, I’d let them know and they may be able to advocate for a faster review. Other than that, there is not a lot that can be done. Alright, thank you for letting me know. But these penalties are temporary and after approprtiate changes are made and the review is done the penalty will be lifted? Inhabe also added around 40 to 50px of spacing between the ads and any content. Yes. If the problem is solved and it is actually the two-click penalty, it will be resolved eventually. I can also confirm it is the two click penalty because I have had some users on my site tell me. What’s the longest you have heard of this penalty lasting? I have confirmed that it is the two click penalty. There is no uniform time period, unfortunately. Great post thanks. So what exactly is the penalty? (1) serving you ads that require “double” clicks to the destination page; or (2) serving you low-revenue ads? If Google continues to serve you the same ad quality even though visitors now require two-steps clicking to the destination, that shouldnt materially affect legit revenue since people who want to visit the advertiser will go thru the quick two clicks to get there. So when an apparent “double click” penalty “results” in lower cpc, ctr, earnings etc., is it really a penalty by Google or is it the system weeding off the “accidental” clicks? BTW, my CPC and earnings (but not clicks) just dropped in the last two days by some 70%!!! I think one of my top performing ad units was too close to a navigation text (I think). Anyway, I tried to follow Tyler’s suggestion of installing the gg publisher toolbar. I got stuck at “… and enable the overlay ” as I see no option to enable anything.